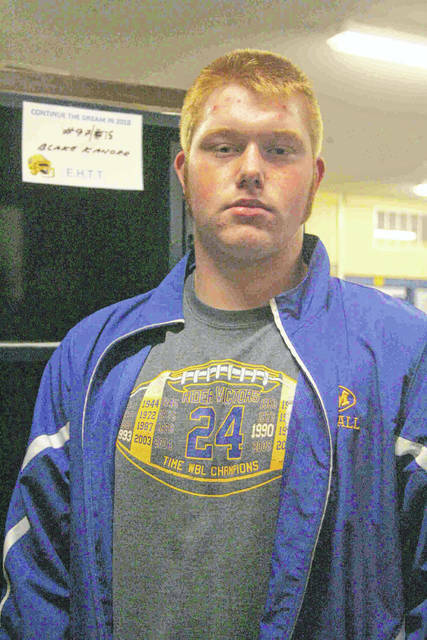 St. Marys’ Blake Kanorr, a junior, was the Western Buckeye League defensive lineman of the year and the All-Northwest District Division IV lineman of the year. The Roughrider defender posted more than 100 tackles and 11 sacks this season. St. MARYS – At St. Marys, the choosing of football captains from one year to the next comes at the end of the season where the outgoing leaders elect the new ones for the upcoming season under the guidance of head coach Doug Frey. Despite being a junior Blake Kanorr was picked as one of the new Roughrider leaders for 2018 and the St. Marys defensive lineman. took his new responsibilities serious and it showed in the team’s success and his personal accomplishments and a mjor reason he was selected the 2018 Lima News Dream Team Defensive Player of the Year. Kanorr, the WBL defensive player of the year and the All-Northwest Division IV lineman of the year, produced 104 tackles with 11 sacks during the regular season. He notched 20 tackles for loss, two fumble recoveries and one interception. Kanorr is part of a St. Marys defense that held opponents to seven points or less in half of their regular season games. In the playoffs the Roughriders have outscored their opponents 141-40. Like most impact players, Kanorr’s journey to being one of the top lineman in the area began in the off season. At the onset of the summer, Kanorr set some personal goals for the 2018 year. Frye describes Kanorr as a player who has that rare combination of size and speed with a tremendous work ethic and a motor that does not quit. He added that Kanorr is also motivated in the classroom. More important Frye adds is that Kanorr loves to play football and be part of the team. Frye said what makes him a good player is that he is gifted but what makes him a standout is his that he enjoys the challenge and has fun. “That is something that is often overlooked and doesn’t show up in the stat box is Blake’s enthusiasm and excitement about the game and hisenjoyment of the game rubs off on his teammates,” Frye said. Kanorr describes his style of play as aggressive and hand-on and there are a number of WBL lineman that can attest to how physical the St. Marys junior can get. Kanorr accepted the challenge of being a team leader and was instrumental in helping St. Marys achieve its team goals like a third consecutive WBL title and a deep run in the playoffs. As the leader on the defensive line, Kanorr sees it as his responsibility to keep the defensive line charged up and ready. As a team during the regular season, the Roughriders had a turnover ration of 24-plus with 20 interceptions and 11 fumble recoveries. Frye said Kanorr is not done growing as a person or a player. “He is a leader by example right now but will be in more ways a leader on next year’s team,” Frye added. https://www.limaohio.com/wp-content/uploads/sites/54/2018/11/web1_Kanoor.jpgSt. Marys’ Blake Kanorr, a junior, was the Western Buckeye League defensive lineman of the year and the All-Northwest District Division IV lineman of the year. The Roughrider defender posted more than 100 tackles and 11 sacks this season.